"We must never allow ourselves to become numb to cruelness in war. We must never give in and let war rule the world. We must fight with undaunted power for the rules that make war just a little bit more bearable. We must fight for the Geneva Conventions! 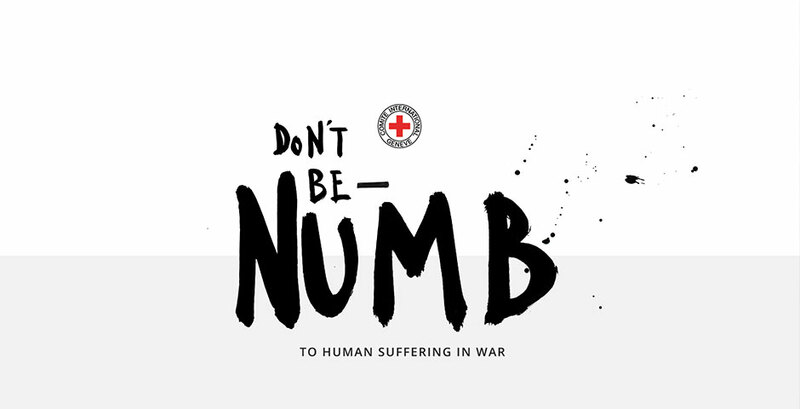 Skybrud.dk is proud to help ICRC with the fight and putting the focus on the Geneva Conventions by making the Don't be Numb website. Don't be numb is a visual, playful questionnaire with elements of gamification that will get the visitor to answer basic questions about the Geneva Convention and rules of war. The visitor earns ""peace medals"" and may eventually win Don't be Numb merchandise if they help spread the campaign on SOME." "It was very interesting and at the same time worrying to dive into the facts and data provided by the ICRC in connection with the assignment. It gave us good insights, but also a sense of anxiety according the downward respect for the Geneva Convention, which has crept into society. Wars without rules never end. A terrifying fact that became crystal clear to us during our work with this cause. We need to keep on promoting the necessity of rules in war and we need to keep educating the worlds population in the content of the Geneva Conventions." "We hope the website can be an eye-opening experience that will affect people and make them realize the importance of the Geneva conventions. We hope that the gamification of the concept will lure more people to answer the questions and thereby gain insight into how their views are in sync with the Geneva Conventions and in relation to responses from the populations of all over the world. We hope that people are motivated to share the message and the campaign on social media and thereby help ICRC open the eyes of the world to the importance of the Geneva conventions. We hope that the majority of the audience has become less numb towards human suffering in war." "ICRC asked us to come up with a concept for visualizing and communicating the results of the “People on war” report. In our research, we concluded that the main problem the report was pinpointing was not only that people didn’t know much about the rules of war, but that they/we also have become numb to human suffering in war. Through our lives we are overexposed with pictures of people suffering; it's why we also become numb towards pictures of this kind. That is why we invented a white environment. We used elements of war, like guns and handcuffs, and painted them the color of peace: white. Handwritten letters in revolutionary style symbolizes that we wan’t to make a change." "In order to be able to spread the important message, we would like the audience to spend as much time on the website as possible. That is why we invented the medals of peace, made by scrap. The user of the website is asked the same questions as the respondents of the survey in the 16 countries the report covers. When the user answers a question, the user instantly can see what the average of respondents answered. If the answer is correct the user receives a medal. When the user has answered all of the questions correctly, the user receives all four medals and can share the medals on SOME. The sharing technology was an important element in the success of the campaign. It became viral." "Greatest challenge: How do you overcome numbness without pointing fingers at the target audience? That was one of the greatest challenges. It was also a challenge to transform a complex subject and 'boring' fact into a simple, easily understandable and visual, playful concept. Most rewarding moment: Our collaboration with the ICRC in Geneva was very rewarding and was one of the main reasons for the success of the campaign. The fact that a small company from Denmark was able to raise awareness about a very important subject was the most rewarding part of this project for us." "We discovered that working with a good cause in a global environment gave us wings and more energy, and made it possible to go above and beyond our own and the customer's expectations. That rocks!" Wars without rules never end. A terrifying fact that became crystal clear to us during our work with this cause. We need to keep on promoting the necessity of rules in war and we need to keep educating the worlds population in the content of the Geneva Conventions.